*If using today’s “Reading Prompt,” please view it prior to reading the article. The world is mourning the passing of one of the greatest leaders of our time. Nelson Mandela is dead at 95. He died on Thursday in Johannesburg, South Africa, from a lung infection. Mandela was a symbol of freedom for the people of South Africa. “Our nation has lost its greatest son. Our people have lost a father,” South African President Jacob Zuma said in an announcement. Mandela was a prominent international figure for more than half a century, first as a leading human rights campaigner in South Africa and then as the world’s best-known political prisoner. Following his release, he again became the leader of the anti-apartheid struggle, and in 1994 became the first president of a democratic South Africa. Mandela fought for the freedom of blacks in South Africa. No one is born hating another person because of the colour of his skin or his background or his religion. People must learn to hate, and if they can learn to hate, they can be taught to love, for love comes more naturally to the human heart than its opposite. 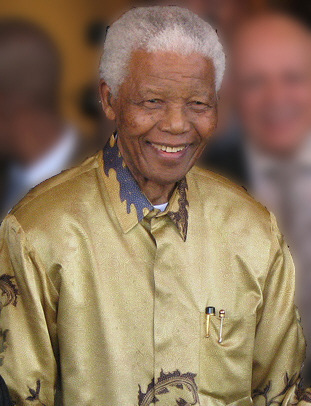 Mandela received more than 250 awards, including the Nobel Peace Prize, the Order of Canada and the U.S. Presidential Medal of Freedom. In 2001, he was the first living person to be made an honorary Canadian citizen. Many monuments and statues around the world have been dedicated to him. Mandela will receive a full state funeral (a special public funeral ceremony that honours people of national significance), and flags will be flown at half-mast. Read more about Mandela’s life and career on the CBC News website. Do you agree with Nelson Madela that it is more natural to love than to hate? Is learning to love easier than learning to hate? How are love and hate different? What do you believe about human nature? *In order to gain an understanding of texts, many readers try to activate their prior knowledge on the topic. With this prior knowledge in mind, readers can understand the context of the new information they are reading (how everything “fits in”).Through discussion with a peer, your teacher, or the entire class, discuss what you already know about Nelson Madela and South Africa before reading today’s article. After reading the article, reflect on how activating your prior knowledge may have helped you understand today’s article better. When and why might an author choose one style over the other? Discuss your ideas with a classmate and then share with the class.